Hello, we are Bill and Phyllis Hodges. The videos we produce are our way of giving something back to the people in the community in which we live. Some of them are done very professionally in the wonderful studios of the Tampa Bay Community Network in Tampa . Spotlight on… is our weekly television program which primarily presents elected officials in a safe and sane environment. The show contains no shouting, yelling or gotchas, but rather it is an attempt by our station to help viewers get to know the people that represent them. Other videos on this site were created in our home studio; they show the clubs and activities of the Sun City Center Community Association (SCCCA). We have separated those videos into three categories: About the Clubs, Special Events, and Association Business. If you are already a SCC resident, thinking of cutting back on your work week, or live somewhere else and the Florida sun is beckoning, this community section will be of great interest to you. A final category of videos are what we call On the Road, a collection of videos highlighting things we have found interesting. These shows are produced in the studios of Tampa Bay Community Network (TBCN) and are primarily aimed at helping viewers to get to know the people that represent them. It is a Hodges team effort; Bill does his part in front of the camera, Phyllis is operating a camera and is floor director. Support for these programs comes from the talented individuals at TBCN. It would be impossible to mention everyone at the station who is involved in making these programs as good as they are; but Pam Garron is in charge of Outreach, and Station Manager Louise Thompson keeps the lights on and cameras rolling. Click on the picture or here to see the lineup of TBCN Spotlight shows for your viewing pleasure. Sun City Center, Florida , is a very special place about 20 miles south of Tampa . It is a wonderful place for those like Phyllis and me who are self-employed or those who are looking for a very active place to retire. It is an 55+ community which is comprised of several sections. 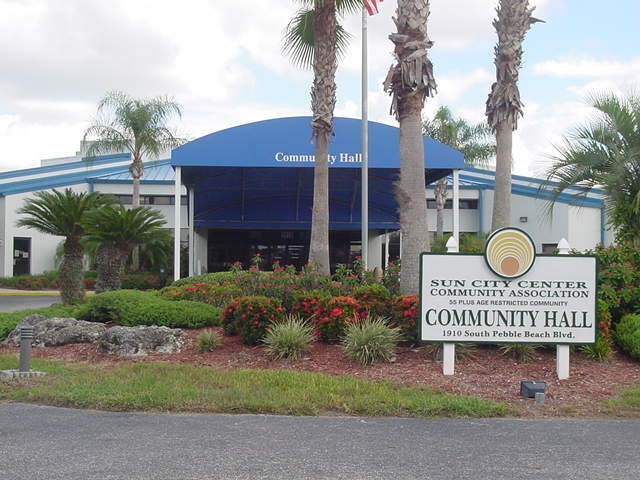 The largest of the two is the Sun City Center Community Association section with about 11,000 members. There is also the Kings Point Association, and you may see some of their activities popping up in our On the Road section. Click on the picture or here to see the lineup of SCCCA Special Event shows for your viewing pleasure. The SCCCA Board of Directors is the entity responsible for conducting the business of our association. Board members are elected by all of the association’s members who choose to exercise their prerogative to vote. In November 2008, for the first time, the Meet the Candidates night was recorded and put on the internet so that those not attending could get a look at the candidates. It should be noted that all recordings in this and the other sections of this website are done with the knowledge of the board, but they are not official and are the best efforts of Bill and Phyllis Hodges. In the future, we hope to spotlight more of the board members as we did John “Woody” Nelson. Click on the picture or here to see the lineup of SCCCA Board Activity shows for your viewing pleasure. The SCCCA has over 160 clubs to which their members can belong. To name only a few, there are sports clubs like softball, pickleball, golf, horse shoes, shuffle board, and tennis; card clubs such as Bridge, Pinochle and Poker; craft clubs such as pottery, sewing, weaving and woodworking; clubs involving music such as ballroom dance, tap dance, organ & keyboard, and line dance. As you can see, this space does not lend itself to name them all, but ultimately we hope to have a video for each of them. If you belong to one of the clubs and they do not yet have a video, ask your president to contact Bill Hodges for information on how to get one. Click on the picture or here to see the lineup of SCCCA club shows for your viewing pleasure. In this section we will put those videos we make from here in Sun City Center that do not fit the above categories and videos we create in other parts of the world that we think others may find interesting. It will really be a potpourri of sounds and sights that we think will please you, cause you to smile, or give you inspiration. So give it a try and see what you can find. Click on the picture or here to see the lineup of On the Road shows for your viewing pleasure. If you would like to see what Bill and Phyllis Hodges do in the world of professional speaking and employee training take a look at our website which will tell you of the training programs we present and the company, government agencies and associations for whom we have worked. Click on the picture or here to see the Hodges Seminars International website.